A pair of identical twin sisters from Minnesota were able to thank the man whose life-saving donation gave them the ability to be kids again. 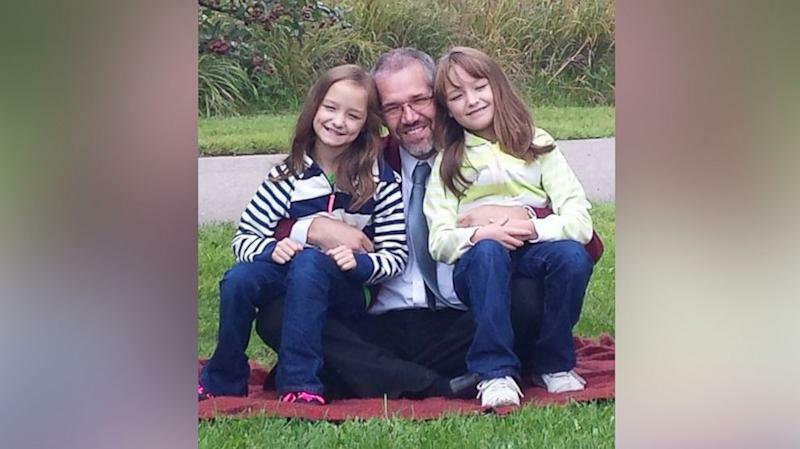 “They fell in love with him right away,” mom Michelle Girtler, 43, of Minnesota City told ABC News today. “They took to him like they knew him their entire life. It was emotional, all of us were emotional. Lots of tears, a lot of gratitude." Elizabeth and Kathryn Girtler, both 9, were born without any blood platelets because of a condition called congenital amegakaryocytic thrombocytopenia (CAMT). A bone marrow transplant to alter the girls' DNA was their only chance for a cure. "It meant that they didn't get to be normal children," Girtler said. "Bumps and bruises and cuts harmed them because they didn't have the clotting agent to stop them from bleeding. Without the bone marrow transplant, their liver and everything was going to shut down. Girtler's son, LeeRoy, 13, had tested negative as a possible donor match for his sisters. Elizabeth and Kathryn's mother and father Brett Girtler, 45, could not donate bone marrow because they were carriers of CAMT, their mom said..
Just under 4 years later, the Mayo Clinic in Rochester, Minnesota, signed Elizabeth and Kathryn up on Be the Match to be possible bone marrow recipients. About 90 days later, Girtler received word that the girls had a match. Elizabeth had the transplant first at the age of 3 in May 2011 and Kathryn followed at age 4 in June 2012. Girtler said doctors didn't want to perform the transplant at once to avoid the confusion of two siblings with the same last name and same condition in the hospital together. In addition, Girtler would have to divide her time caring for each twin. This year, Elizabeth and Kathryn's doctor, Dr. Shakila Khan of the Mayo Clinic, submitted their story to Be the Match in hopes of setting up a meeting between them and their then anonymous donor. The man, Ingo Gruda of Munster, Germany, was flown to Minnesota to meet with the girls over four after their transplants, Be the Match confirmed to ABC News. The gala was hosted by the organization last week where the three got acquainted, and celebrated the twins' good health. Girtler said Gruda spoke to her family via a translator. "He had told us his story about when he got the phone call when he was at work," she said. "He's a construction worker and was on the scaffolding. He sat down and started to cry. That touched me. “He said that someone asked if somebody got hurt and he said, 'No, someone's going to be reborn.' For me, that showed he knew the meaning of what he was doing." Today, both girls are thriving and even danced with Gruda at the gala. "My girls understand how sick they were," Girtler said. "Elizabeth broke down watching a video montage of everything they've been through. They are very, very much 9-year-old little girls now; very typical. They're rambunctious, swimming, playing with their brother. There's really no words to describe being able to see your child live life. It's amazing." Girtler hopes her twins' story will encourage others to become donors.